TICKETS: Limited reserved seating $45* Includes 3 course dinner and the show. Cash Bar available. Tickets now available on our website www.theaterleagueofclifton.com (select the TICKETS tab). Tickets may also be purchased by check, by mailing to Theater League of Clifton, PO Box 4072, Clifton NJ 07012. If purchasing by mail please include the performance date and an email or phone number. Mystery dinner show spoofs the movie Casablanca and the American Dream of winning the jackpot. 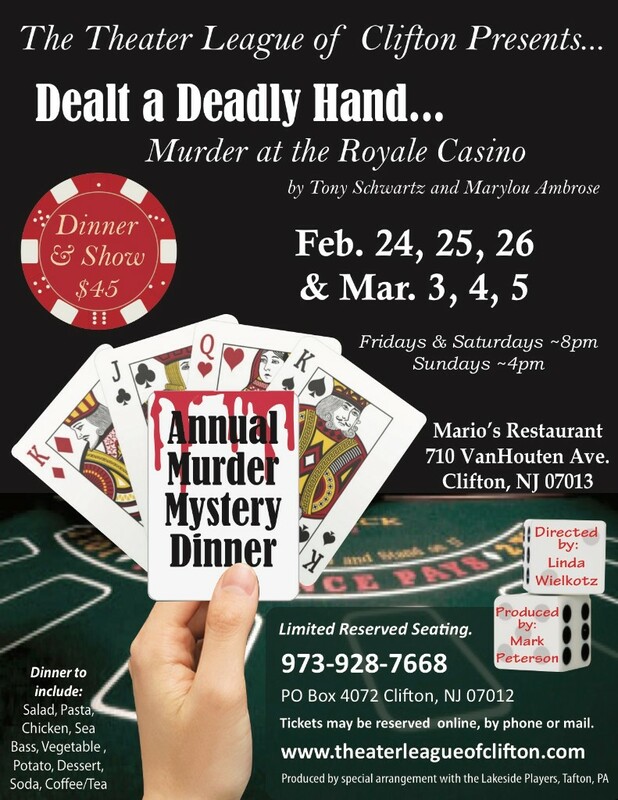 You'll meet crafty Native Americans, sneaky senior citizens, an Austrialian Croc Chaser, a two-faced lawyer, a kid with two left feet, a gambling casino owner with a Humphrey Bogart complex, and a gold digging ex-wife.Come join our cast for this evening of Murder AND Laughs.